SWEDEN was long seen as the most progressive country in Europe, with its generous welfare state and openness towards refugees. But the national and regional elections on September 9th are likely to mark a turning point. 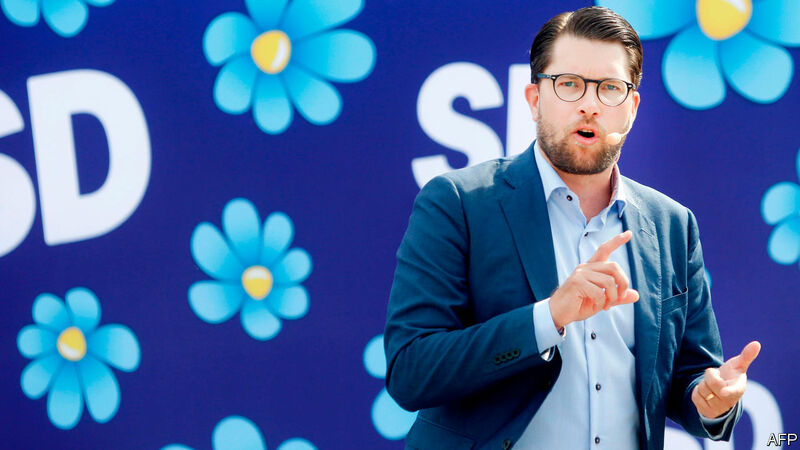 The Sweden Democrats (SD), an anti-immigrant, Eurosceptic, populist party, are expected to increase their vote share to about 20% (up from 13% in 2014) and gain dozens of seats in the countryâs 349-member parliament. The governing Social Democrats, the centre-left party that has led the country for most of the past 50 years, are polling at historic lows of 25% or less. The centre-right Moderates are doing even worse, at about 17%. Their allies on the rightâ"the Christian Democrats, the Centre Party and the Liberalsâ"may win enough votes to join them in a minority government, but it will be a weak coalition in a fragmented parliament. Meanwhile, outside Sweden, the election is seen as a test of the strength of Europeâs anti-immigrant right, three years after the migrant crisis of 2015. In some ways the SD resemble similar outfits in other Nordic countries, such as Norwayâs Progress Party, the Danish Peopleâs Party and the Finns Party. But while those parties have all participated in government in one form or another, the SD have been shunned by the rest of the political establishment (as have the National Rally in France and the Alternative for Germany). This is partly because the party started out in the late 1980s as an explicitly racist outfit whose founders were in many cases neo-Nazis. Since Jimmie Akesson (pictured) became the leader in 2005, though, the SD have grown more moderate. They now say they want to reduce immigration sharply, not end it, and they attack Swedenâs lax integration policies, which they say lead to segregated ethnic neighbourhoods with high rates of unemployment. Their popularity has grown since the migrant crisis, when Sweden took in 163,000 refugeesâ"more than any European country other than Germany. A rise in violent crime over the past two years, especially gun battles between gangs with immigrant backgrounds, has also helped their cause. Yet the SD continue to back a number of unserious policies. They want to accept only refugees who have suffered oppression in neighbouring countries. (Since Sweden borders Norway, Finland and Denmark, they do not expect many.) They also include some unsavoury members, and in recent weeks have expelled over a dozen candidates found to have ties to racist groups such as the Nordic Resistance Movement. Since 2014, Swedenâs other parties, which fall into two broad alignments on the left and right, have agreed to shun the SD and allow the larger side to govern and pass budgets, even if it lacks a majority. While the Moderates suggest they may be willing to discuss some issues with the SD, their allies still promise to boycott them. Immigration and crime are not Swedenâs only big issues. The country faces a severe housing shortage. The S ocial Democrats and their allies, the Greens and the Left party, want more subsidised social housing. The Moderates and their partners favour rent-control liberalisation and incentives for private development that guarantees some apartments for the poor. Then there is the decades-long decline in school quality. The left wants to renationalise the system and end government funding of private schools; right-wing parties want to keep it. The issue most on votersâ minds, according to a pre-election poll, is health care. But voters worried about health care split their votes among various parties. Those who care most about immigration opt overwhelmingly for the SD. A weak minority government will have a hard time addressing the issues Swedes think crucial. In the long run, the rest of the countryâs parties may have no choice but to work with the populists.